Audi A1 & Damien Hirst Experience - We Are Fearless | Boldness with backup. 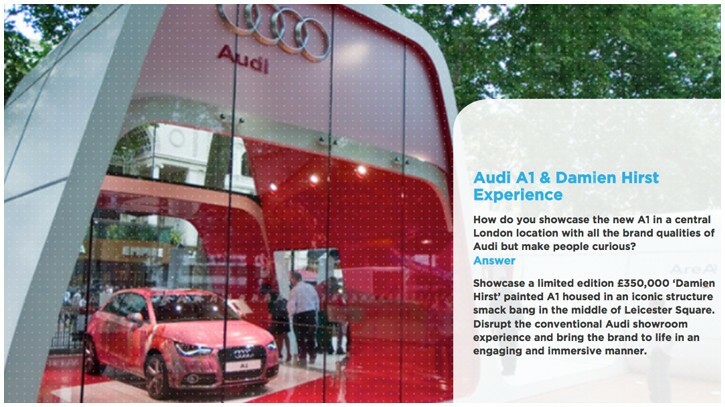 How do you showcase the new A1 in a central London location with all the brand qualities of Audi but make people curious? Showcase a limited edition £350,000 ‘Damien Hirst’ painted A1 housed in an iconic structure smack bang in the middle of Leicester Square. Disrupt the conventional Audi showroom experience and bring the brand to life in an engaging and immersive manner.